Temperature is a critical parameter for all laboratory applications. It can upset the consistencies or phase conditions of various analytes, and alter the reaction dynamics of substances under analysis. Incident heat must be mitigated by ensuring stable facility conditions wherever heat-sensitive samples are handled or stored. The temperature of clean rooms and refrigerators are typically calibrated for application-specific temperatures, and careful handling procedures are employed to reduce the risk of sample spoiling due to external temperatures. Heating elements and heat-treatment sample chambers meanwhile are monitored and adjusted using sensitive thermocouples. Thermocouples are sensors consisting of two metal wires welded at a temperature-sensitive junction. They are integrated into laboratory heaters and thermal processing equipment to obtain internal temperatures as an electrical value. This value is transferred to a dedicated temperature controller, where researchers can observe and adjust the sample parameters as required. 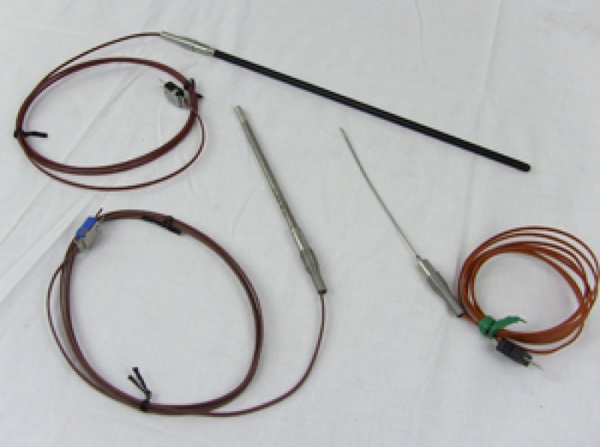 Type K thermocouples, which are general purpose temperature probes comprised of chromel—alumel wire legs. These feature recommended temperature range of -50°C – 1000°C (-58°F to 1832°F). Type T thermocouples are comprised of copper—constantan wires with a temperature range of roughly 0°C – 370°C (0°F – 698°F). Each of these thermocouples is available to distinct specifications, with optional synthetic fluoropolymer coatings of polytetrafluorethylene (PTFE). These chemical-resistant coatings protect the thermocouple’s insulating sheath to reduce the risk of mechanical failure due to corrosion. Thermocouples acquire the electrical signal pertaining to a sample chamber’s temperature conditions, but digital thermometers and temperature monitors convert that signal into a legible value for research applications. It provides the base signal for process control and monitoring in temperature critical research applications. Our precision heating controls are available with distinct thermocouple specifications, each of which is capable of acquiring temperature data with an accuracy of within 1.0°C. Glas-Col provides laboratory solutions for any application. Our heating systems utilize some of the most established thermocouple junction materials and temperature controllers on the market, providing outstanding temperature monitoring accuracy and precise levels of experiment control. Our thermocouples are provided on a call to order basis, with distinct wire arrangements for application-specific requirements. Find out more about our laboratory heating systems, or contact us for more details on our thermocouple products and services.